Founding Feminists is FMF’s daily herstory column. We relish in the memories of feminist history by recapping all of its glorious milestones victories. 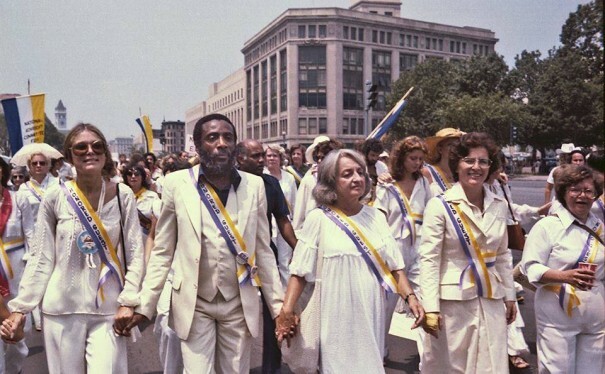 In the largest march for women’s rights in the nation’s history – nearly three times the size of the largest suffrage parade, and at least twice as big as the landmark August 26, 1970 march in New York – a hundred thousand supporters of equality took to the streets of Washington, D.C., today to call for an extension of the deadline for ratification of the Equal Rights Amendment. Appropriately, the first banner in today’s march paid tribute to the National Woman’s Party’s founder, and the author of the E.R.A. : “Alice Paul, 1885-1977.” This was followed by an antique trolley car carrying several veterans of the battle for “Votes for Women,” which ended successfully on August 26, 1920, after a 72-year effort. Numerous participants saluted the suffragists by dressing in white, as many had done in parades and pageants, plus other events such as the “Silent Sentinel” picketing of President Wilson from 1917 to 1919. The unexpectedly large turnout overwhelmed everyone, from organizers who had to delay the start for 90 minutes, to police who suddenly had to close all of Constitution Avenue instead of just half. It was more than three hours after the start of the march that the last delegation finally made its way from the Mall to the rally on the West Steps of the Capitol. There the crowd heard 35 nationally known speakers tell why the E.R.A. is needed and that the battle can be won. We are here because our hearts are here, our souls are here and our spirits long for liberty and justice. And we will not – we will not ever – accept a country in which we remain second-class citizens ! The E.R.A. – liberty for women – is not an idea. It is not just a hope. It is a spirit that lives in each one of us, and it can’t go away. We can’t go home to the 19th Century because we are going to march into the 21st ! So we will march, we will demonstrate, we will petition, we will write letters, we will work this summer like we have never worked before, and we will march into history. We will finish and complete the American dream. We will make real the promise of equality for all. Former N.O.W. presidents Wilma Scott Heide and Karen DeCrow were there to participate in N.O.W.’s largest event ever, ably coordinated by Jane Wells-Schooley, who had only weeks to turn a N.O.W. Board Resolution into a march and rally of truly historic proportions. The campaign for the Equal Rights Amendment was formally kicked off by the National Woman’s Party on July 21, 1923, as part of its commemoration of the 75th anniversary of the Seneca Falls Women’s Rights Conference of July 19-20, 1848. The E.R.A. was introduced into the U.S. Senate on December 10, 1923 and into the House three days later. It was passed by Congress on March 22, 1972, following overwhelming approval by both House (354-24) and Senate (84-8). A seven-year deadline was set at the time, but as was first noted by law students and N.O.W. members Catherine Timlin and Alice Bennett, the deadline is not part of the text of the amendment, so it can be altered or deleted by a simple majority of Congress. “Section 2: The Congress shall have the power to enforce, by appropriate legislation, the provisions of this article. The extension resolution is currently being considered by the House Judiciary Committee, and a vote is expected soon. As many as 5,000 of today’s marchers are expected to stay overnight and then participate in Monday’s “Lobby Day” on Capitol Hill to keep up the momentum generated by today’s mass march. Though time is short, and just 256 days remain until the original deadline expires, today’s turnout has caused a justifiable boost in optimism. There’s a universal consensus among the marchers that E.R.A. ratification is only a question of “when” or “how,” and not “if,” because as in the struggle for suffrage, there is no time limit on seeking equality, or on how long feminists are willing to work for that goal. David became a lifelong admirer of the suffragists after briefly encountering them in a high school textbook in the early 1960s. Though missing out on that first part of the struggle for equality, he became active in "second wave" feminism through LA NOW in 1974 and has been a full-time feminist, TV news archivist, and women's history researcher at the Feminist Majority Foundation since its creation.